A lot of us don't realize the constant, if not daily, abuse our hair receives. Regular coloring or bleaching, or even just exposing it to the sun for long periods of time can lead to a lot of hair damage. The most abuse my hair faces is from my curling wand and flat iron. My hair is naturally wavy and a little frizzy, so I have no choice but to tame it down with a combination of high heat and metal. It's also a little on the dry side, which is why daily conditioning and using a hair mask every 2-3 days is a must for me. I'm thankful my hair has never really been classified as damaged. I used to think it was, but I've been reassured by more than one salon stylist that it's not. It's just dry. So when I heard the buzz on social media about a mysterious, new 'miracle' hair product, I was intrigued! 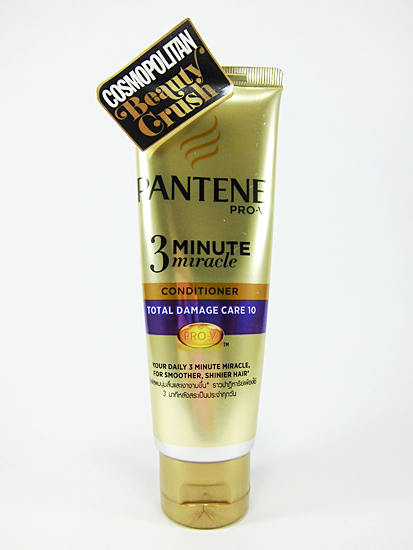 Fellow beauty bloggers soon began revealing that it was Pantene Pro-V's new 3 Minute Miracle Conditioner. At the time it wasn't available in the market yet, so I figured I'd just have to wait to get it for myself. But then I received an e-mail from BDJbox.com (a beauty subscription service) that I was one of the random, lucky members chosen to try it out before it was released! Woohoo! All I had to do was fill out a quick survey, provide my details, and after a few days it arrived at my door. So, of course, I'm here to review it for you! Product info: With up to 80% more of the key conditioning ingredient vs Pantene’s regular conditioners, Pantene 3MM contains the highest ever level of advanced Terminal Amino-Silicones (TAS). This helps protect hair’s inner structure. By the protecting the moisture balance of hair, Pantene 3 Minute Miracle transforms brittle, rigid, and damaged hair to touchable, soft, beautiful hair. Damaged hair is negatively charged and has lots its protective layer thus causing frizzy and rough hair. The new 3 Minute Miracle Conditioner has an improved conditioning agent which neutralizes negative charges on the hair and forms a protective layer to prevent future damage. This isn't your everyday conditioner here. What the product promises is that in just 3 minutes it can repair months worth of damage, as well as protect it from any more. In short, you'll be stepping out of your shower with shinier, smoother, frizz-free hair. So even if my hair isn't damaged, I did want to see added smoothness, shine, and no more frizz! Who doesn't, right? Unlike your typical conditioners that tend to have a thick consistency, the 3MM conditioner is slightly creamier and almost gel-like. This made it easier to spread through my hair evenly, and this coming from someone with long, thick hair! I also love the fresh and delightful scent it has! Pantene says it's "based on fresh wild strawberry and raspberry accord enveloped in a floral, creamy heart underscored with warm vanilla." Too bad the scent doesn't last very long. Basically the drier your hair gets, the more it fades. Here's my air dried hair after using the 3MM conditioner for the first time. Yup, you can definitely still see a little frizz, but I usually get more than this with ordinary conditioners! 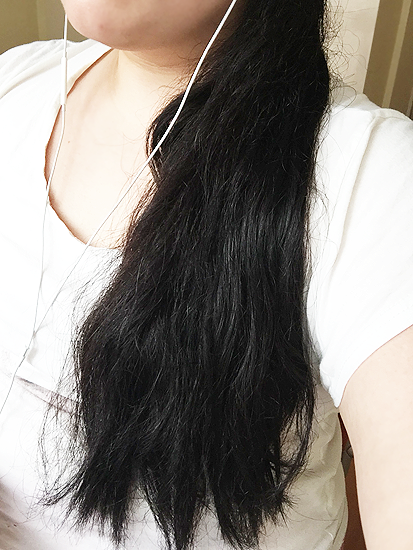 You can also see that most of the frizz is concentrated towards the mid-length of my hair and upwards (next to my neck) where I applied less conditioner, so it definitely did the job of taming down frizz for me where I applied more of it. Though I don't think my hair was visibly shinier, it was softer to the touch! Plus, there were hardly any tangles to deal with when I was combing. Even with ordinary conditioners, I sometimes have to tug through my hair when combing, but not with the 3MM conditioner. It was almost like I applied a light spritz of detangling formula. Actually when I was applying this in the shower, I could feel my hair untangling itself as I ran my fingers through! I've used the conditioner daily for almost 4 days now and I'm happy to report that it does keep my hair nice and soft, and also tangle free when I step out of the shower. Frizz is more controlled when I continue to air dry it too, but my hair isn't entirely frizz-free yet. It also helps control frizz somewhat when I style my hair by straightening or curling it, or even when I just blow dry it. Perhaps my hair is a little bit shinier too, but so far it's still not significant enough for me to really comment on it. Does my hair seem healthier and stronger overall? Does it seem protected from further damage? I guess you could say that. "Seem" is the key word though. At the very least it maintains my hair well. I still get the same amount of hair fall I do everyday, and my hair doesn't look or feel drier even with semi-regular hot styling. I'll take that over my hair's condition getting worse, thank you. Maybe with continued use I'll see even more improvements with my hair, but I'll have to grab myself another tube of this stuff to do that. In less than a week I've nearly finished it all up! I did only receive a 70ml tube though, so I'm not too surprised. For someone with hair as long and thick as mine, I need almost a palm full of conditioner so I should really be using the 340ml variant. Reduces tangles and makes hair easier to comb. Doesn't weigh down hair or promote oil even when you apply it to the scalp area. The scent disappears once your hair dries. My hair doesn't appear shinier even after using it more than once, but maybe after long-term use this effect will be more visible. I don't have split ends and my hair isn't prone to breakage, so I can't say if the product helped to repair or prevent them.